These images resemble rock drawings the artist viewed on sacred boulders at 9,000 ft. elevation in the mountains of Wyoming. This is a sacred and mystical area overlooking glacial lakes. 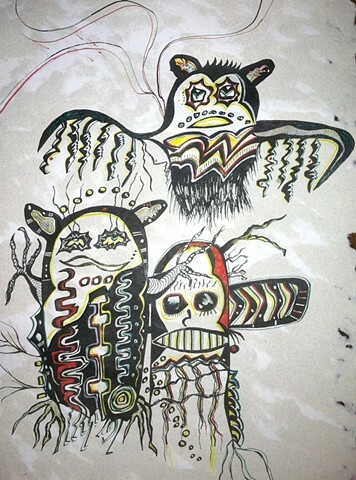 These three free spirited images are drawn with India Inks on handmade acid free archival cotton papers. The artist combined two colors of paper in the pressing, giving the appearance of rocks or clouds. When this work is held up to light, looking through the paper is magical. It might be best to frame this piece between two pieces of glass in order to see the texture of the paper.